The latest report from consultants We Are Social – Digital, Social, and Mobile in China in 2015 – finds continued growth in Internet usage as well as ongoing heavy engagement with social and mobile platforms among Chinese users. Out of a total population nearly 1.4 billion people, We Are Social estimates there were 668 million active Internet users in China as of August 2015. Nearly all of these Chinese netizens – 659 million – are also active social media users, a total which surpasses the user base of the US and Europe combined. Chinese users spend an average of nearly four hours per day online on desktop or tablet devices and another three hours per day on mobile devices. Overall, digital media accounted for more than half of all media consumption among Chinese adults in 2015. Mobile continued to earn a larger share of Chinese Internet traffic in 2015. 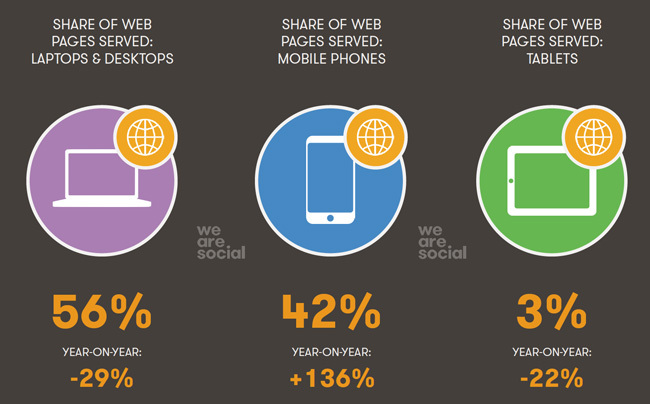 While desktop devices still account for the majority of pages served as of August 2015, mobile is closing quickly with 42% of all pages served in 2015 and year-over-year growth of 136%. 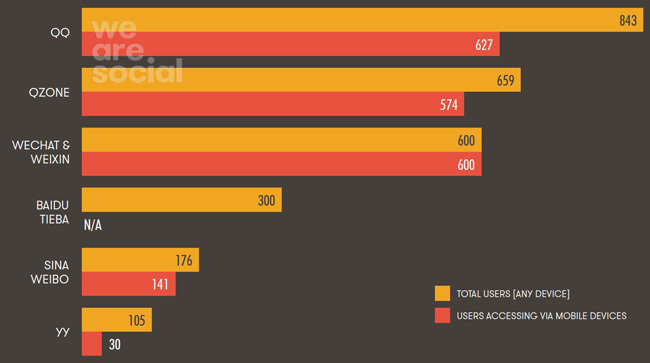 As the following chart illustrates, the major social channels in China continue to drive a lot of this increased usage. The most-popular channels remain the linked QQ and Qzone platforms, both of which have shown strong growth in their active user bases since 2014. The biggest gainer in 2015 may have been WeChat, which is up from a reported 355 million monthly active users as of March 2014 to 600 million by August 2015. Owned by the dominant Baidu search platform, Baidu Tieba is a Reddit-like discussion forum. It makes the list of leading platforms for 2015, owing in part to major functional and interface changes over the last couple of years. We are learning more about how prospective students use different digital tools at different stages of the decision-making process for study abroad. In a number of world markets, search engines and school selection sites play a greater role during the discovery phase of students’ research – that is, the point at which they are learning about different institutions and trying to identify colleges or schools that could be a good fit. Many of these students will then use social media to further inform their choices after that initial discovery process. A recent student survey from Chegg, however, suggests a greater role for social channels throughout the search and discovery process for Chinese students. 27% participated in a live chat. Overall, nearly 90% of prospective Chinese students indicate they will use social media when deciding on an institution or school. The following chart illustrates the types of sources and channels most often used by students to research study options abroad. Note the significant role played by major search engines, but note too that the search landscape is very different in China. In contrast to Google’s clear dominance in many world markets, the search engines of choice in China are homegrown. Baidu is the Chinese market leader and accounts for about 60% of all search activity in the country. This means that if you are not operating a dedicated site in China or otherwise ensuring that your out-of-China website is properly indexed by and optimised for engines such as Baidu, then your visibility in many Chinese search results is going to be greatly reduced. The Chegg survey results also point to a significant role for both social media and messaging platforms in the prospective student’s search process. Nearly 60% of survey respondents said that instant-messaging apps, such as WeChat or QQ, would be the tools they are most likely to use when searching for colleges or schools abroad. Just over seven in ten responding students also indicated that connecting with currently enrolled students – again via social or messaging platforms – is their top priority during this research process. This strong interest in connecting with peers is reflected in the following chart, which presents a different view of the importance of various search tools for Chinese students. The figure shows students’ ranking of the usefulness of different types of sites and tools for their study abroad search process, and here we see that social and messaging platforms are the highest-rated options among responding students. A related blog post, also from Chegg, reinforces the point by arguing that WeChat may be the single-most important platform for foreign institutions in China. Such accounts pose a number of interesting challenge for foreign recruiters. As we noted in an earlier post on the subject, “When it comes to working your way up the learning curve, a consultant or agency can help orient you to social media in China – who is who and the do’s and don’ts – but in most cases an external agency probably can’t take the place of a solid in-house initiative. That internal effort begins with appropriate staffing. You will need a Chinese-language speaker to navigate the country’s social networks.” Given the strong interest in peer connection that drives this social and messaging activity, institutions will also want to find creative ways to integrate current students or alumni into their outreach on Chinese platforms. This entry was posted in Asia, China, Marketing, Most Popular, Regions and tagged postgraduate student recruitment, undergraduate student recruitment, alumni recruitment, student enrolment, higher education marketing.